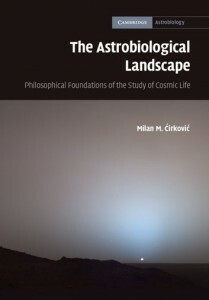 In The Astrobiological Landscape, Ćirković takes the reader on a philosophical journey through the development of the scientific field that is astrobiology; from ancient Greek philosophies to present-day endeavours. From the outset the inextricable link between cosmology and astrobiology is repeatedly highlighted, as is the need for greater cooperation and unification between these and other disciplines, including philosophy for advancement. This book is not merely a review of past and present astrobiological and cosmological endeavours, but a critical discourse of various key scientific publications, theories and methodologies. Common non-scientific perceptions of astrobiology, particularly those skeptical of its scientific foundation, are also discussed. The author delves into some of the controversial issues surrounding astrobiology, for example the very definition of life in a cosmological context and how we will recognise it, post-biological evolution, whether we are ‘the first’, the inherent anthropocentrism, and, quite significantly, observation selection effects. Among hypotheses critically discussed at length are: the multiverse hypothesis, the Galactic Habitable Zone, the Rare Earth and the Twin Earth hypotheses. The Astrobiological Landscape is put forward by the author as a means of unifying the fragmented nature of astrobiology. Unsurprisingly for such a volume, SETI is reviewed in detail. Common anti-SETI arguments, e.g. Simpsons, the Fiasco and Carters arguments are discussed at length, in addition to what the author terms foundational criticisms. While Ćirković is clearly a proponent of SETI, he voices some personal criticisms, viewing the Drake equation as “a rough and trivial rule of thumb” of little relevance to current astrobiological research, while he believes that current SETI programmes suffer a lack of strategy and require a revision of methods. The latter particularly refers to the need to search for alternative traces of life, for example astroengineered structures, rather than focusing on attempts at communication. There is an air of optimism throughout this book, the author believing that, through unification of efforts among the scientific disciplines, astrobiology will both gain wider acceptance as a science in its own right and make great scientific progress. This volume provides an excellent survey of and discourse on astrobiological concepts. Biologists, unless versed in cosmology, will likely not fully comprehend some of the arguments, as many of the works referred to in this volume belong in the field of cosmology and are only briefly, if at all described. This being said, even this biologist with her limited cosmology understanding found the book enlightening.